Fresh rioting broke out in Algiers today as police were deployed around mosques and football matches were suspended after protests over food prices and unemployment. Riot police armed with teargas and batons maintained a strong presence around the Algerian capital’s main mosques. In the popular Belcourt district, rioting resumed after Friday prayers. Young protesters pelted police with stones and blocked access to the area. The official APS news agency said protesters ransacked government buildings, bank branches and post offices in several eastern cities overnight, including Constantine, Jijel, Setif and Bouira. In Ras el Oued this morning, buildings belonging to the state-run gas utility Sonelgaz, the council and the tax authority were seriously damaged along with several schools, APS reported. Earlier this week hundreds of youths clashed with police in several cities and ransacked stores in the capital. 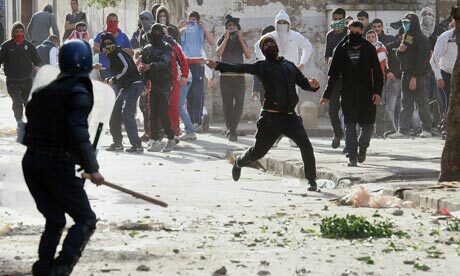 Police used teargas to disperse youths in the Algiers neighbourhood of Bab el-Oued, where the most violent protests occurred. The Algerian Football Federation said today’s league fixtures would be postponed to prevent the organisation of rallies, which the country has banned under an emergency law in force since 1992. The cost of flour and salad oil has doubled in recent months, reaching record highs. A kilogram of sugar, which a few months ago cost 70 dinars, is now 150 dinars (£1.28). Unemployment stands at about 10% percent, the government says; independent organisations put it closer to 25%. Official data put inflation at 4.2% in November. With oil prices soaring, Algeria can afford to spend more on more on subsidies to placate the rioters. Shortly after the first riots broke out on Wednesday, the trade minister, Mustapha Benbada, said prices of sugar and edible oil would be reduced “in the coming days”. Those damn Israelis. Oh, this is about Algeria? Sorry.